The Tale of the Princess Kaguya is a thoroughly odd duck when it comes to animated films. Its visual base is a simple watercolor design, it mixes its high fantasy with historical fiction and slow, contemplative pacing (with a runtime of 137 minutes, very long for an animated feature), and the story comes from a tenth century fairy tale from its home country of Japan. Simply put, this movie is an extremely hard sell to most, myself included. But I am very glad I ended up watching it, for it is dazzling, both from a visual perspective and an emotional level. Taking a traditional story that will be foreign to many audiences and giving it an immediacy and involvement is one thing, but at the same time director and co-writer Isao Takahata never feels like he’s talking down to those who the film was originally made for – individuals who likely know the legend already. This careful balancing act turns out as a tremendous success, and is therefore a richly rewarding experience. Based on “The Tale of the Bamboo Cutter”, The Tale of the Princess Kaguya is about an old bamboo cutter named Sanuki no Miyatsuko (voiced by James Caan in the English-language dub) who lives in a small village with his wife (voice of Mary Steenburgen). They never had any children of their own, but one day, whilst the man is working in the forest, he finds a bamboo shoot that glows brightly, and when he approaches it, the plant expands quickly and opens to reveal a small doll-sized girl. Taking her back home, the creature turns into a normally proportioned baby, and so the bamboo cutter and his wife raise her, and name the child Princess. What’s very clear is that Princess is not a normal girl – indeed, while she performs normal activities like playing with the other kids in the town, she grows at an incredibly fast rate. She is named Little Bamboo by the villagers because of this eccentric attribute. The bamboo cutter begins to witness supernatural events that he believes are signs from above that a now near-adult Princess (voice of Chloë Grace Moretz) should move away from her small hometown and live with the wealthy in the capital city. He sets off and has a large mansion built for her using gold that spouts forth from a bamboo shoot one day, and he, his wife, and Princess travel off, against the girl’s wishes. She is given the name Kaguya, and many notable suitors compete for her hand in marriage. However, she is deeply dissatisfied with her new high society existence, and soon yearns for nothing more than to return to her old friends and neighbors back home. 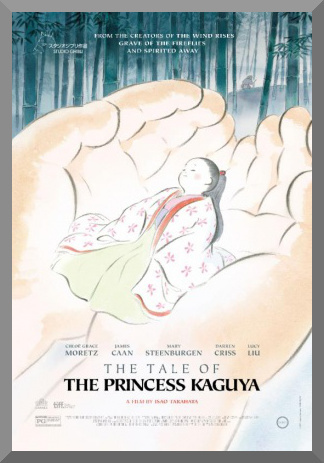 The Tale of the Princess Kaguya is a truly beautiful production, both inside and out. Its watercolor scheme invokes a classical, aged feel while still putting on a degree of timelessness. Setpieces, which range from monochrome wooden houses to grand fantastical parades careening across the clouds, are breathtaking in a multitude of ways. While many of the film’s fellow productions from Studio Ghibli include their grand elements in fully modernized and gleaning colors, textures, and effects, The Tale of the Princess Kaguya emphasizes a more simple approach, and considering the presentation of the story, which exists in a mixture of period drama and far-flung fantasy, it works. And beyond discussion of the pure aesthetic of the movie, the music, from Ghibli veteran Joe Hisaishi, is, as always, a note-perfect accentuation of the events occurring onscreen. While he may not provide any memorable melodies here, what he does accomplish absolutely works. The English voice cast, which beyond Caan, Steenburgen, and Moretz, also features work from Darren Criss, Oliver Platt, Lucy Liu, and Daniel Dae Kim, among others, is solid, with each actor imparting a unique identity to their characters. While the running time of two-and-a-quarter hours feels a bit long, actual excess fat in the screenplay is surprisingly low in quantity, meaning that cutting things to create a tighter running time may have hurt the story and flow of the film in the end – The Tale of the Princess Kaguya is leisurely placed by nature, not by accident. One of the mistakes made by we Western audiences is constantly placing animation as a child-only medium. As I have repeatedly mentioned in reviews of other Studio Ghibli productions, like Spirited Away and The Wind Rises, this particular production company is paramount in dispelling such an assertion. Young kids will likely be bored to tears, and some older viewers may be too, but for the rest of us, this is something to be observed and cherished, not only for the craftsmanship on display, but also the inner-messages, such as the potent themes of coming-of-age and longing. Moving and subtly tragic, The Tale of the Princess Kaguya is a delightful and fulfilling movie, and while not a masterwork, still remarkable to behold.